This applies to all trucks and buses with a gross vehicle weight rating (GVWR) of greater than 4500 kg or trucks and trailer combinations with GVWR greater than 4500 kg, whether they are used for commercial purposes or not. It also applies to wheelchair accessible vehicles used for non-personal use. See Vehicles Inspected to the National Standard. Starting January 1st, 2015, Ontario is adopting the National Safety Code Standard 11 Part B (NSC 11B) as an update to the current Regulation 611. NSC 11B significantly expands and modernizes the requirements for annual inspections, as well as clarifying and detailing the pass/fail criteria for inspected components. Avoid surprises! Be ready before your yellow sticker expires. 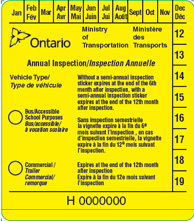 For an overview of the changes, check out Differences Between Inspections on the MTO website. More on the goals of the National Standard can be found here. If you have any questions, don’t hesitate to give us a call.